The city sparkles quietly 40 floors below. 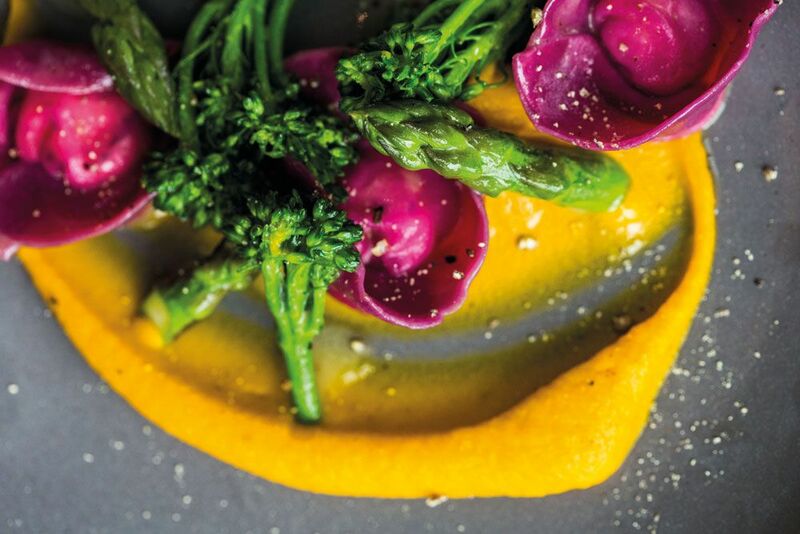 In the CBD’s new sustainable skyscraper CapitaGreen, Artemis Grill’s view bewitches diners as they savour colourful grilled dishes, which incorporate flavours inspired by the Mediterranean. Sophisticated brown-toned furnishings contrast with turquoise plates, lime green pillows and a mammoth red flower—the district’s new architectural icon—within view from the Sky Forest al fresco bar. Inside the kitchen, chef Fernando Arevalo parallels CapitaGreen’s environmentally conscious philosophy: meats and seafood are from sustainable sources—the former, in particular, are also grass-fed and free of hormones. Chef Arevalo, who was formerly from Bistecca Tuscan Steakhouse also under The Red Door Group, has trained with Osteria Mozza’s Mario Batali, a leading force in the realm of eco-friendly restaurants. As an appetiser, a generously-sized octopus tentacle, twirled into a loose bundle on a plate, makes one wonder about the actual size of the mollusc. (The restaurant manager later reports that the Spanish species was about his height!) Its thick meat is sous vide overnight until tender but still with a slight bite, its charred exterior bringing the crunch. Playing up the savoury juices are the sides comprising a mildly sour pickled padron pepper, an olive that bursts with a hint of saltiness and a sweet cherry tomato confit. Also from the grill but portioned as a main is the Scottish Loch Fyne salmon. Crusty and lemon juice-drenched on the outside, and a sweet medium-rare inside, it’s complemented by lighter flavours from a baby fennel salad and roasted purple potato that gains punchy notes from sprigs of dill. The spicy iberico pork presa has the taste and texture more like smoked duck. The shoulder cut is succulent from being slow-cooked and grilled, and it’s as fiery as its name prewarns, with a peppery crusting made from chilli, lemon, coriander, paprika and herbs. To go with the pork, the waiter recommends crispy heirloom cauliflower—a vegetarian-friendly side dish the restaurant is arguably most proud of. Its mouth-watering aroma hits you fast and the flavourful batter bursts in the mouth. Alternatively, try the fig, orange and fennel salad. Sprinkled with walnuts and feta cheese, and doused in caramel vinaigrette, it has a refreshing marriage of textures and flavours that subdues the heat from the pork dish. The beetroot tortellini is a must-try even if you’re not a vegetarian: bright purple, al dente pasta filled with a bright creamy mix of feta and ricotta cheese is laid over a daub of sweet puree made from carrots, apples and cinnamon, whipped to a buttery consistency. Stalks of asparagus and broccolini beautify the dish with their vivid green shades, and also add a crunch. The dessert menu is succinct with five options. The apricot and lavender souffle is one of the more popular picks. The sweetness of the fluffy souffle is chased by a lingering taste of lavender, which may be an acquired taste for some, but a dash of walnut creme anglaise cuts it with a light nutty flavour. There’s a long list of organic and biodynamic wines shipped from around the Mediterranean to pair these dishes with, but if water is your pick for the meal, we’d suggest going with the theme: enjoy free-flowing filtered still or sparkling water for an affordable $3 per head, of which $1 is donated to Whole World Water’s clean water projects.